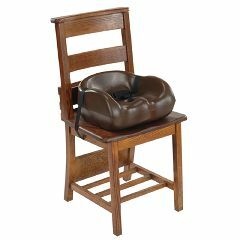 AllegroMedical.com presents The Special Tomato® Soft-Touch™ - Booster Seat. The Special Tomato® adaptive seating systems are available in various sizes, colors and modular offerings. The perfect on-the-go seat for your child! The Special Tomato® Soft-Touch™ Booster Seat is the ideal seat for restaurants, relative's houses or community events! The Booster Seat can help position your child with special needs in a household chair so they are at eye level with their peers. The Booster Seat was developed for children with good head control and strength who can sit unassisted. It is used for elevating the seating surface of a child with minimal seating needs. Plus it uses the soft-to-the-touch material found in all other Soft-Touch™ products. So it is sure to be a comfortable experience for your child!